Interterm 2019 Travel Courses are now closed! Interterm 2020 Travel Courses will open in August 2019, please check back for more information then. For more information about Travel Courses, attend one of our Travel Course First Steps sessions offered several times a week. A cost range will be given for each Travel Course. The final cost of the Travel Course will be determined by the number of participants enrolled. The Cost Range does not include any tuition costs. The most current interterm tuition costs can be found through the Student Business Services. For undergraduate students with full-time status in the preceding fall and full-time status in the following spring, tuition costs may not apply. Graduate students must check with their program for tuition costs. 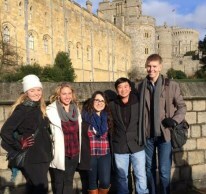 Undergraduate Chapman students who identify as First Generation can apply to receive assistance for travel costs for study abroad. Go to Chapman's Promising Futures and click on "Promising Futures Funding Assistance" link. Also view other scholarship opportunities for short-term programs.